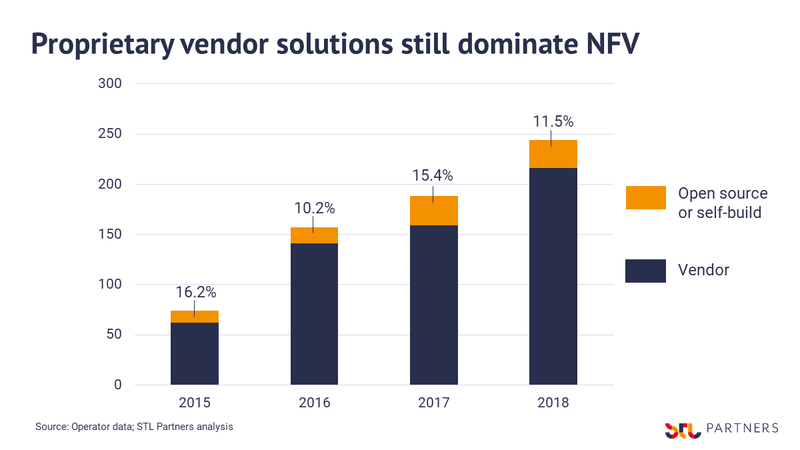 Is the industry on track to deliver NFV’s promise of truly open hardware and software platforms? Our chart of the week suggests not when based on recent performance. Telcos were supposed to deploy virtual network functions from multiple vendors on the same hardware. In reality, most deployments have been from single vendors supplying virtualised 4G mobile cores, primarily EPC and IMS. Even while open-source and operator self-build deployments increase, they average at a miserly 13% of overall deployments. This is over the last four years. So far, most vendor deployments are virtual machine versions of existing hardware-based mobile cores. This is instead of cloud-native re-writes. This restricts how they can be developed and recombined more independently and flexibly. 5G roll-out will be crunch time for NFV and for vendors. Operators will demand more cloud-native, distributed, virtualised platforms to make their 5G business models work. So the competition between established vendors, new players and different open source projects is about to hot up. First published as our chart of the week on 23 January 2019. Our charts are snapshots of data that offer a talking point or prompt to think about a particular market or vertical. To give your thoughts on the story behind the data, add your comments on our LinkedIn page.